When we try to define what our children really “get” from Montessori, we need to expand our vision to include more than just the basics. Of course they learn to read, do four-digit mathematics, recognize geometric shapes, and identify the parts of a plant and a mollusk. They also learn how to be a contributing member of a community. A Montessori school is more than a classroom. It is a society in a microcosm, and the skills and lessons they learn in this environment extend well beyond the traditional definition of academic success. They are life lessons that were very much needed at the time when Dr. Montessori developed her teaching methodology, and they are life lessons that remain relevant to our children today. In A Montessori Mother, Fisher wrote, The phrase, ‘Casa dei Bambini,’ is being translated everywhere nowadays by English-speaking people as “The Children’s House,” whereas its real meaning, both linguistic and spiritual, is “The Children’s Home (or Children’s Community, ed. ).” Fisher insisted upon this rendering, which she felt offered a much more accurate and complete insight into the character of the Montessori classroom. Dr. Martin recognized that “This misreading of the Italian word ‘Casa’ as ‘house’ has effectively cut off two generations of American educators from a new and intriguing vision of what school can and should be. Read ‘casa’ as ‘house’ and your attention is drawn to the child-sized furniture, the Montessori materials, the exercises in practical life, the principle of self-education. But if you read ‘casa’ as ‘home,’ you begin to perceive a moral and social dimension that transforms your understanding of Montessori’s idea of a school. Martin realized that what Montessori had established was not simply a more attractive classroom in which children would be taught to read and write. The Casa dei Bambini represented a social and emotional environment where children would be respected and empowered as individual human beings. It was an extended family, a community in which children truly belonged and really took care of one another. Montessori described this process of emotional growth as “valorization of the personality,” a strong sense of self-respect and personal identity. Within this safe and empowering community, the young child learned, at the deepest possible level, to believe in herself. In an atmosphere of independence within the community and personal empowerment, she never lost her sense of curiosity and innate ability to learn and discover. Confident in herself, she opened up to the world around her and found that mistakes were not something to be feared, but rather an endless opportunity to learn from experience. This special relationship that is so common among Montessori children and their teachers and schools is very different from, and much more dramatic than, the experience most children have in school. “I started in Montessori at age two. I’m a product of the entire system. I did well, but still many people wondered if I had been prepared for college and whether I could ‘make it’ in a ‘real’ school? The skepticism was so disconcerting that I never bothered to step back and see what 15 years of trust, respect, teaching, and learning had done for me. When I went off to Northwestern University, I left my support system and community behind and entered a world that was much colder and uncaring. To understand how this evolved, it’s helpful to understand the world in which Montessori lived at the time she developed her educational approach. There were basically two approaches to the treatment of disturbed individuals. The most common and familiar treatment was to confine people who acted strangely to insane asylums. The second, and almost forgotten, approach was the “Moral Education” movement that spread across Europe and North America during the 1700 and 1800s. These therapeutic communities were villages set off in the country where chronically despondent or nonviolently dysfunctional individuals lived in group settings with caring individuals. The fundamental principle of the Moral Education movement was respect and kindness. Instead of treating their patients as prisoners, the staff acted on the belief that within each human being there is a core of goodness and a “sound mind.” The community lived and worked together as an extended family and developed a sense of belonging that is dearly reminiscent of what we see in our children’s classrooms today. These communities were much like an Israeli Kibbutz, self-sufficient farming communities in which each individual was encouraged to become more independent while contributing to the overall operation of the village. Patients lived in small homes with a couple who served as their mentors. Surviving reports suggest that a great bond developed among those who lived and worked together. The movement recorded success rates that were far more effective than traditional approaches; returning their clients to their home communities as productive, happy citizens after an average stay of eleven months. A sense of close personal community and positive human relationships was proven successful as a means to help bring these disturbed people back to reality. Montessori was well aware of this movement through her medical research into innovative strategies for treating the intellectually disabled. She used this same model with tremendous success in her own work with mentally disabled and autistic children in Rome and later hypothesized that even more dramatic results might be achieved with “normal” children. Her first “Children’s Community” was made up of 60 inner-city children from dysfunctional families. 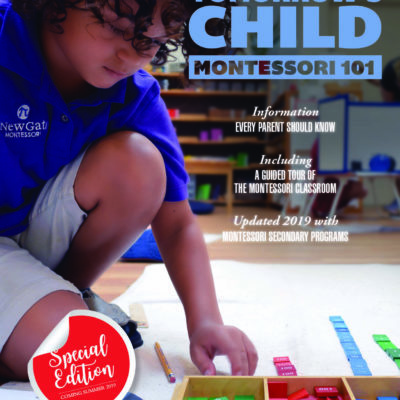 In her book, The Montessori Method, Montessori describes the transformation that took place during the first few months of operation, as the children evolved into a “family.” The children had a sense of becoming the owners of their school. They were encouraged to rearrange the furniture, prepare and serve the daily meals, wash the pots and dishes, help the younger children bathe and change their clothes, sweep, clean, and work in the class garden. Through their day-to-day involvement in their classroom community, Montessori saw these children develop a sense of maturity and connectedness that helped them realize a much higher level of their potential as human beings. While times have changed, the need to feel connected is still as strong as ever. In fact, for today’s children, it is probably even more critical. Whether it’s an inner-city child or a child from an affluent suburb, the sense of community has all but disappeared from our children’s lives. Families regularly move from house to house, and from town to town. Grandparents usually live in other cities or other states. Both parents work out of necessity, and when they are at home, they are very, very busy. The over-programmed, hurried child has become the norm for this generation. of belonging, are especially important to children today. Along with whatever else Montessori gives our children, it definitely gives them the message that they belong-—that their school is like a second family. Children will normally grow up to be productive, happy and confident individuals if given the right emotional environment. It seems clear that our attitudes about people, the ability to overcome our egocentric tendencies, our willingness to share, to compromise, to resolve conflicts non-violently, and our ability to discover an underlying sense of self-worth are not qualities that human beings develop spontaneously, but rather through years of experience with caring people who convince us that we belong and give us the opportunity to practice and master these skills of everyday living. As in all things, we learn by doing. 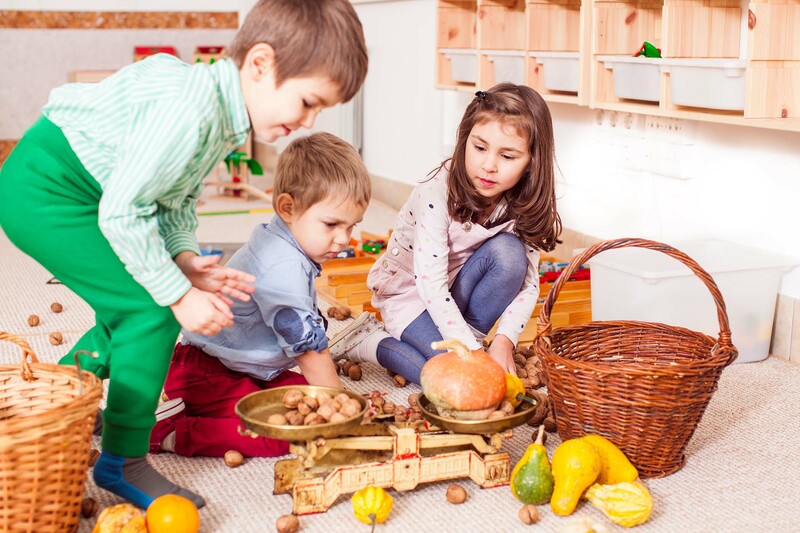 One of the greatest strengths in the approach that Montessori developed is the three-year age grouping that you will find in every Montessori school. By consciously bringing children together in a group that is large enough to allow for two-thirds of the children to return every year, the school environment promotes continuity and the development of a very different level of relationship between children and their peers, as well as children and their teachers. For teachers, this relationship presents itself as a commitment that they make to stay with the children in their class for a prolonged period, rather than jumping from job to job or from classroom to administration. Montessori teachers do more than present curriculum. The secret of any great teacher is helping students open their minds and hearts so they are ready to learn; where motivation is not focused solely on good grades, but a fundamental love of learning. As parents know their own children’s learning styles and temperaments, teachers, too, develop this sense of each child’s uniqueness by establishing a relationship over a period of years with the child and her parents. Montessori schools give our children not only the sense of belonging to a family but also of how to live with other human beings. 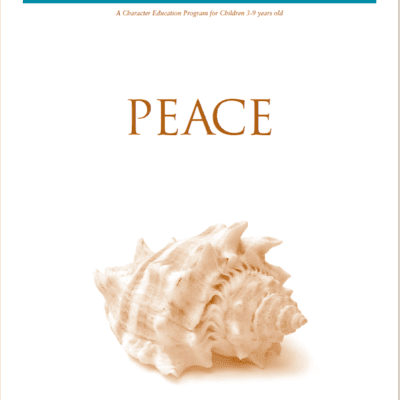 By creating a bond of parents, teachers, and children, Montessori sought to build a community where individuals could learn to be empowered, where children could learn to be a part of families, where they could learn to care for younger children, learn from older people, trust one another, and find ways to be appropriately assertive rather than aggressive. To reduce these principles to the most simplistic form, Montessori proposed that we could foster peace by healing the wounds of the human heart and producing a child that is more secure. She envisioned her movement as potentially leading to a reconstruction of society. Montessori schools are different, but it isn’t just because of the materials that are used in the classrooms. Look beyond the pink towers and golden beads, and you’ll discover that a classroom is a place where children really want to be—because it feels a lot like home. Tim Seldin is the President of the Montessori Foundation and Chair of the International Montessori Council. 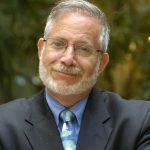 His more than forty years of experience in Montessori education includes twenty-two years as Headmaster of the Barrie School in Silver Spring, Maryland, which was his own alma mater from age two through high school graduation. Tim was the co-founder and Director of the Institute for Advanced Montessori Studies, the Center for Guided Montessori Studies, and currently also serves as the Head of the New Gate School in Sarasota, Florida. He earned a B.A. in History and Philosophy from Georgetown University, an M.Ed. in Educational Administration and Supervision from The American University, and his Montessori certification from the American Montessori Society. Tim Seldin is the author of several books on Montessori Education, including How to Raise An Amazing Child, The Montessori Way with Dr. Paul Epstein, Building a World-class Montessori School, Finding the Perfect Match - Recruit and Retain Your Ideal Enrollment, Master Teachers - Model Programs, Starting a New Montessori School, Celebrations of Life, and The World in the Palm of Her Hand.